cosmix.org | Is Formula One finally getting exciting? Is Formula One finally getting exciting? 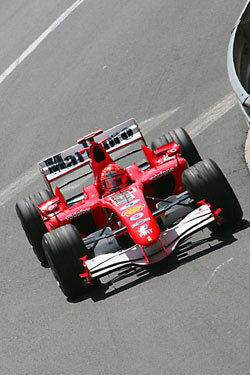 After many years of boring championships, 2005 was the first time signs of ‘change’ began to make their appearance in F1. Renault won the championship instead of Ferrari, Alonso became a respected driver of his generation ending a streak of five championship wins for Michael Schumacher and Ferrari and, a year later, Schumacher, the undisputed champion of the past decade, the best driver of his generation and — arguably — of all time, retired from the sport paving the way for an overhaul at the top, triggering a series of contracts and moves between the top teams. This year we saw Renault disappoint with below-average performance, Alonso overshadowed by his ‘sensational’ 22 year old teammate Lewis Hamilton at McLaren, and a four way battle between the drivers of the two top teams, Kimi Raikonnen and (also very impressive) Felippe Massa from Ferrari and Fernando Alonso with Lewis Hamilton from McLaren looming ahead for what is probably going to be the most exciting year in Formula 1 since the turn of the century and a reminder of the multilateral intra and inter-team battles of the late 1980s and early 1990s. Is this the beginning of a new, exciting era for F1, or just a glimpse of how good things used to/could be? Image by user DjMagra @ Flickr. Used under Creative Commons 2.0. Looking at the results and the championship tables, yes, it looks exciting. But the races themselves bring sleepiness mostly. Qualifying is written off altogether since 2003, and I believe that the sole reason that the previous system isn’t restored yet is some people’s unwillingness to admit they were wrong. As for the race, there is a (mild) excitement for the first few corners of the race, and then a (techical) agony during the pit stops, but only if the main contenders managed to stay close enough to leave a possibility for the stop to make some impact. In-race overtaking? No, thanks, too dangerous, and the sponsors will be too unhappy if you crash yourself out of the race. Not to mention the complete catastrophy this will be for the championship, thanks to the “new” point system we have. Qualifying is indeed problematic, and politics was (and is) a major issue in Formula 1. I agree with you on practically everything. The only thing I don’t share is your pessimism. I am optimistic about the future; I think Formula 1 will need to get better as it’s hit rock bottom earlier this decade. And I think it is. Compared to 2000-2004 when Ferrari/M.Schumacher dominated and everyone else trailed behind them, the races now feel more ‘alive’ than they’ve been for many years. Maybe it’s just wishful thinking on my part, but I think things will improve, despite the ever-present politics, stupid regulations and team dynamics ruining it. Stavrosg is 100% right. Let’s take a look at last race in Montmelo. There was ten seconds of emotion and ten seconds more for Kimi’s suspension of suspension. Twenty seconds are enough for what F1 promises. By the way, do you know that, in Spain, Alonso is not what you can say an idol because of his arrogance and public statements? At least I would say 30% cannot stand him. Cosmix, I was in Athens for a couple of hours last week. I will tell you more as soon as I can. PS: May the best pilot ever could have been Senna and not Schumi. Schumi lacks something except for titles. I can only hope your optimism is justified. Before even the inimitable Senna’s reign, I remember Lauda’s fiery first F1 career, Nelson Piquet overthrowing the infallible Prost, Keke Rosberg and Alan Jones running head to head at Paul Ricard, Villeneuve’s fatal accident. I’ve forgotten more than I can remember about F1’s glory days, but the last decade or so of the sport has seemed to me as a dreary slog, and an overindulgence of an industry with a troubled conscience. I’ve forgotten more than I can remember about F1’s glory days, but the last decade or so of the sport has seemed to me as a dreary slog, and an overindulgence of an industry with a troubled conscience. Indeed. I feel exactly the same. And — to be honest — I have given up on it (in the sense that I am not following it as closely as I did when I was younger). F1 is burdened by a stupid amount of politics, a lot of advertising money and a bloated regulatory framework. The situation cannot be remedied overnight and F1 is not what it used to be. Yet, I do see a change from the previous years — even if it is marginal — and that’s worth noticing. Perhaps I’m wrong and F1 is doomed, but as they say hope dies last. @Antonio: Akismet didn’t like your message and flagged it as spam. :) Send me an email about your trip. Pity it was only for a few hours; we could’ve met as it’s been a while and it’d be a good opportunity. I don’t particularly like Alonso, although he is a top tier driver. I believe Schumacher was a good driver, but came across as an obnoxious, arrogant person. As such I never particularly liked him, yet I cannot but admit he’s one of the greats as far as (technical) driving ability goes. I wouldn’t (and didn’t) compare him to Senna or Prost or any of the earlier greats; people that I respect and like much more; Rightfully or not, Senna has become a legend, something reinforced by his early death. I don’t think we can ever be certain about driving skill. It depends on dozens of factors, mindsets, technology and what not.